Amethyst on spaceship lentil bead necklace. Fluid ring necklace that goes with absolutely everything. 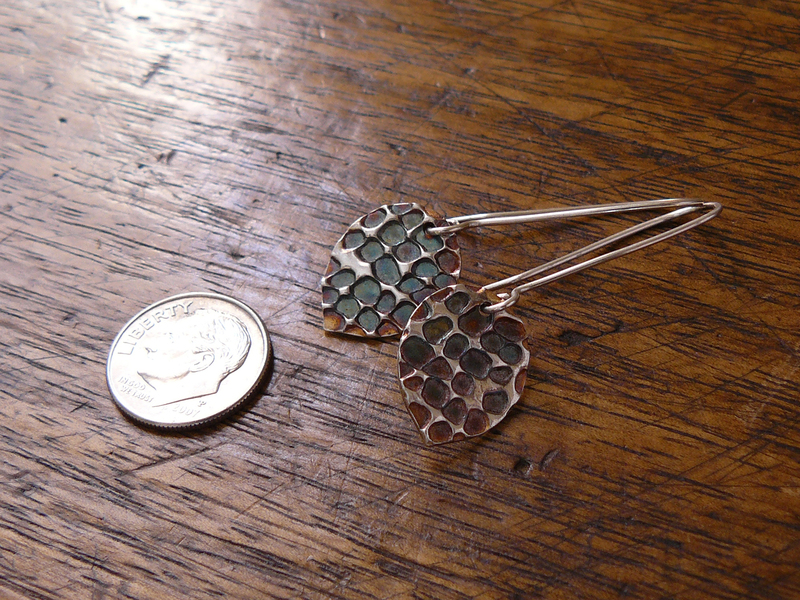 Dragon scale earrings with wildly colorful patina and the long ear wire style. This is not a great picture of these. 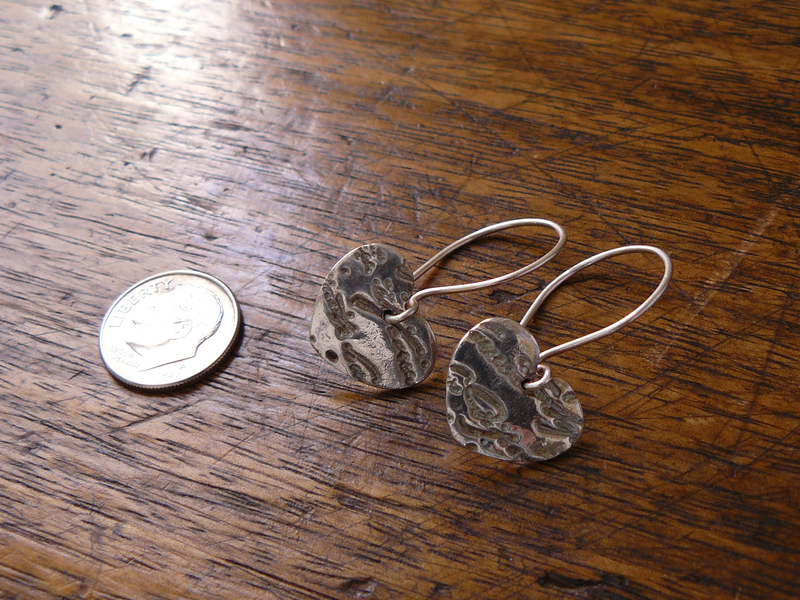 Hearts with texture of an old love letter in french and larger rounded ear wires. I will be doing two new shows in November so that you can find some lovely hand made, one of a kind gifts this year. I will be doing the Mistletoe at Metro event on November 22. The Metro Centre is less than 10 minutes from me so how could I pass that up! I will also be doing the Walnut Grove Farms Christmas event the three days after Thanksgiving. Walnut Grove Farms has the most amazing location, it is a barn that is over 100 years old. You must see this beautiful, rustic place to believe it. I will be posting some new photos as soon as I have a day with morning sunshine. It is raining again today. 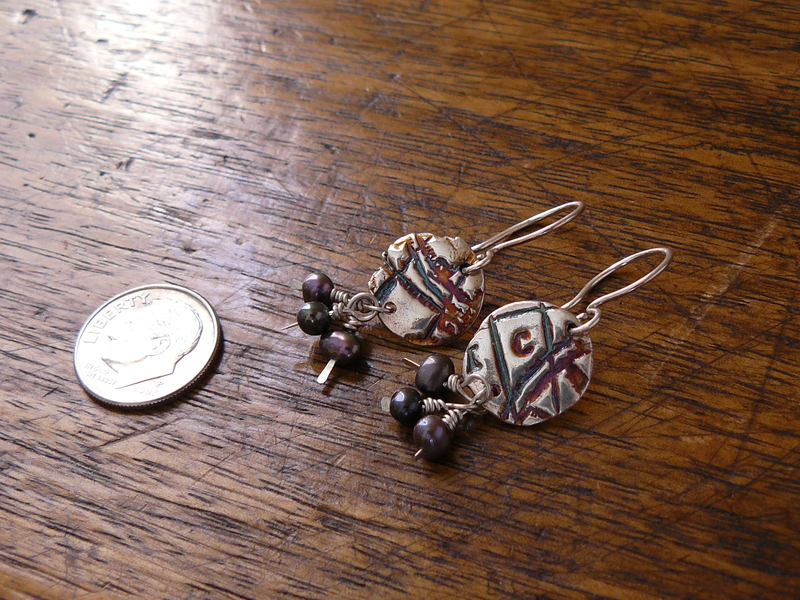 This is pretty typical for fall I suppose but I am just itching to show you some new enameled earrings I made! 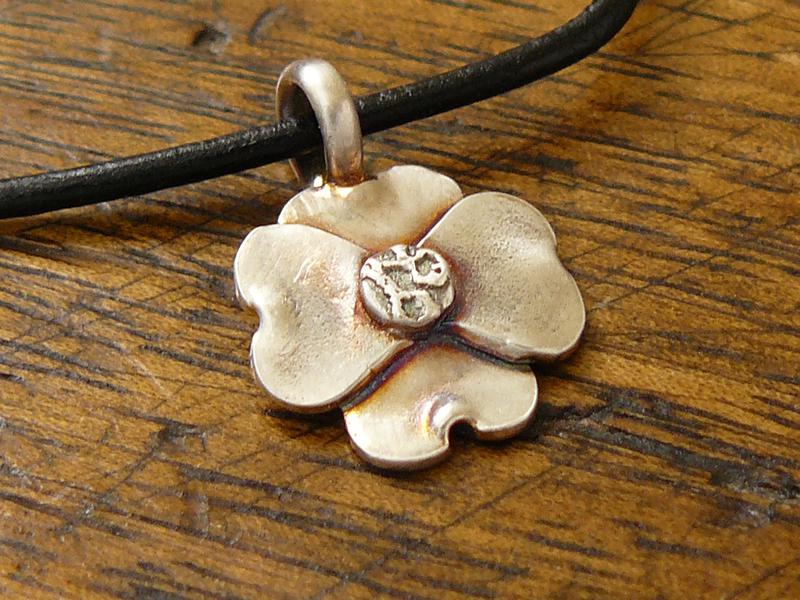 As many of you already know, I have been making dogwood inspired jewelry for a long while now in honor of the fact that they were a favorite flower of my mother and in making these I honor her memory. I love doing these and I love the way some of you have connected with the pieces, either because of my story or because you have your own reasons to love dogwoods. Many of you have shared those with me and it has been a joy and an inspiration. I noticed however that I have not posted a recent photo of any of them. So in correcting that omission, here are some recent pieces. 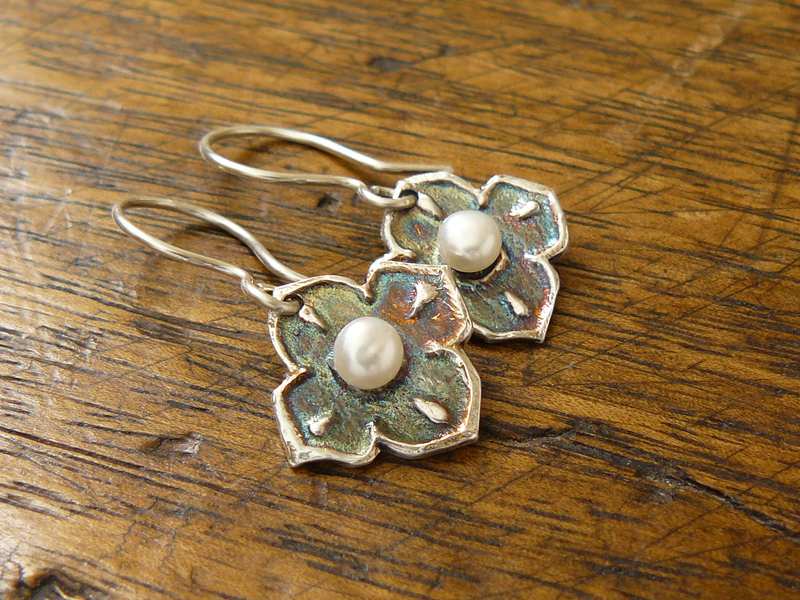 Three dogwoods on a woodgrain backing with a cultured pearl. This is one of the more elaborate pieces I have done. This piece has a lovely warm patina and is similar to many that I have hand sculpted. I have used many different textural elements for the centers, this one is a blossom texture plate. 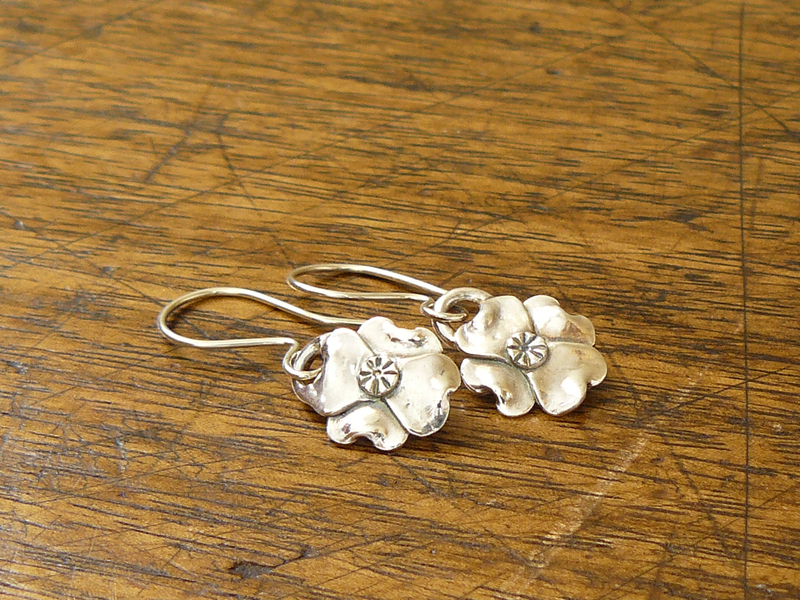 This is a simple earring design I do with dogwoods that has a radial center and little stem like handles to hold the flowers on the dangle wires. 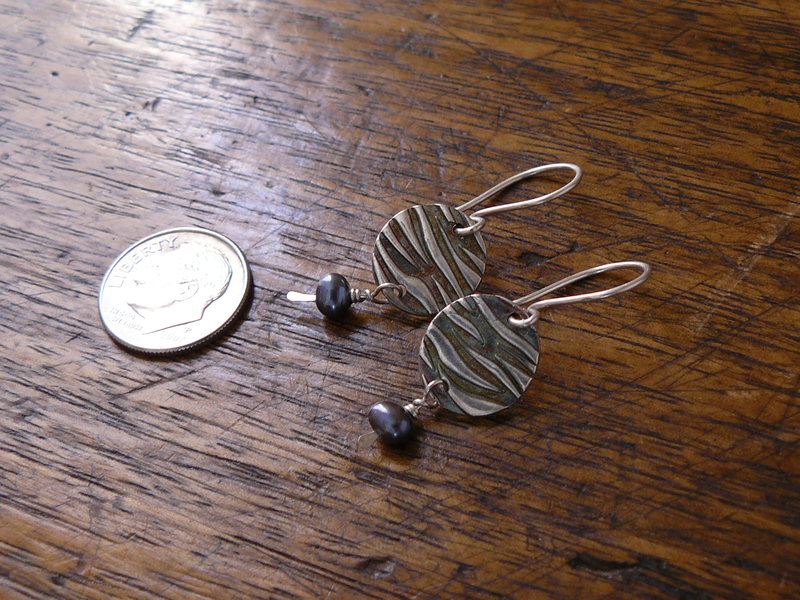 This pair of earrings is from my hand detailed texture plates. 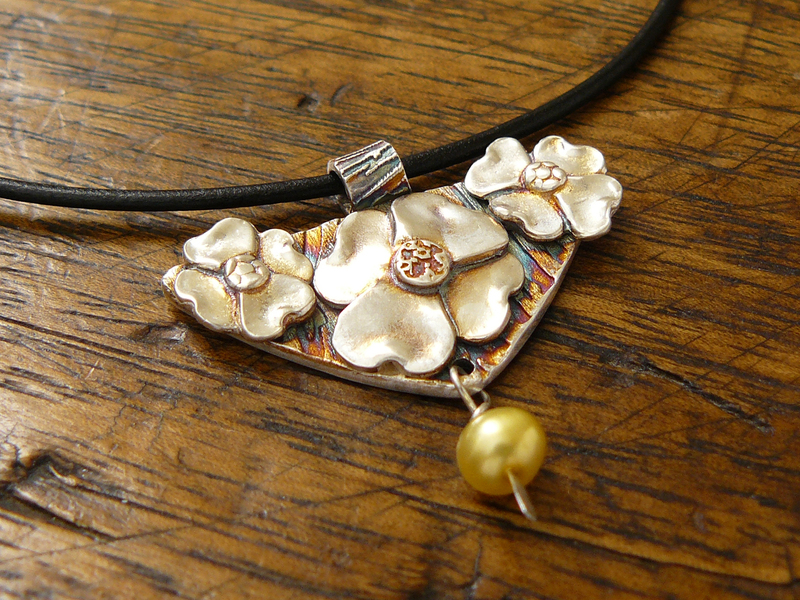 This one is an oriental dogwood with the pointed petals and is adorned with button cultured pearls and heavily patinated. 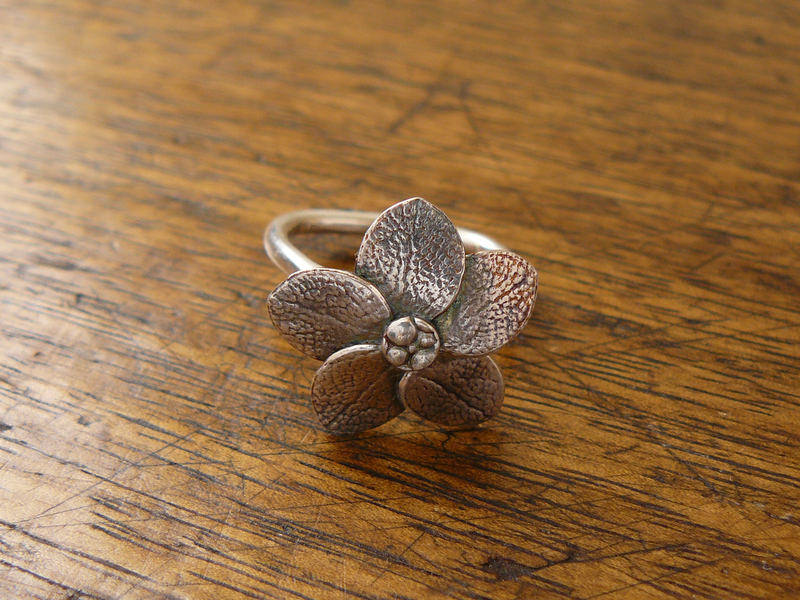 Above is a fine silver floral ring that uses sage leaf molds I made from my own garden grown sage for the texture. I have been thinking a lot about rings lately. 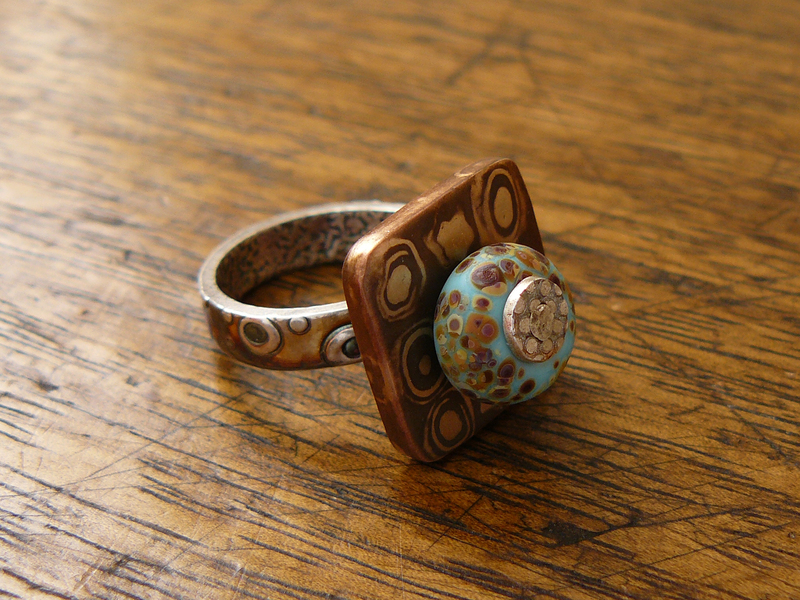 I love the challenge of ring making. Below is a ring that is quite complex. 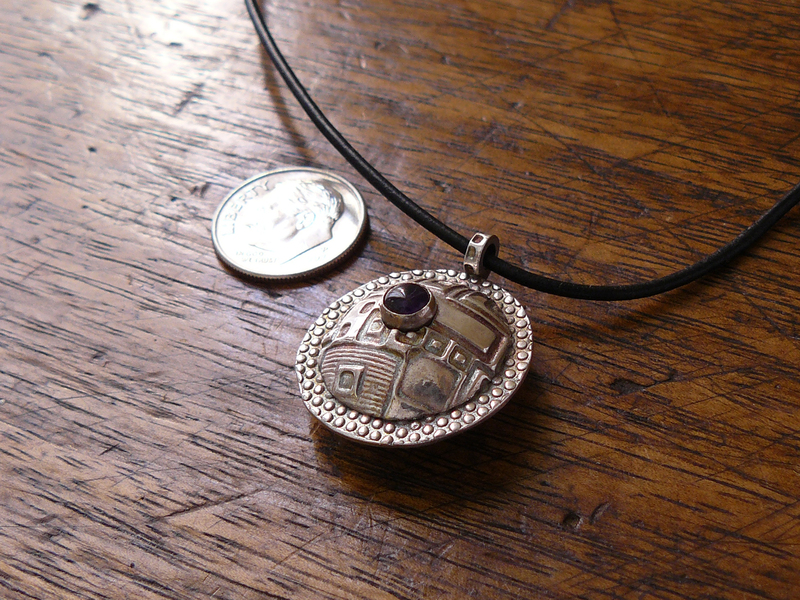 It contains a square shaped element that is constructed of copper and bronze which is riveted to a fine silver ring along with a hand lamp worked glass bead and a little silver disc to protect the glass during the riveting. I will be at the Gazebo Art Festival in Macomb this Saturday to display these and many more. The fair runs from 9am to 5pm and is Saturday only. I am busy preparing for the Lincoln Art and Balloon Festival coming up this weekend and I noticed I had never photographed some rings I recently finished. 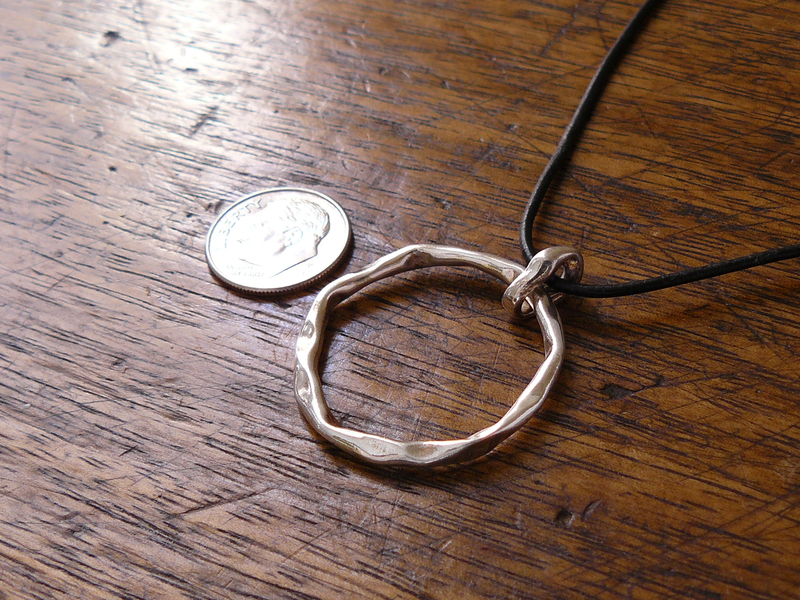 Designing rings has turned out to be a joyous endeavor. I find that rings are much more three dimensional than other jewelry. I don’t just mean that they wrap around your finger. If you ignore the shank and just think about some item hovering over the top face of your finger the designs that come to mind are quite different than thinking of an element against the chest or dangling from the ear. 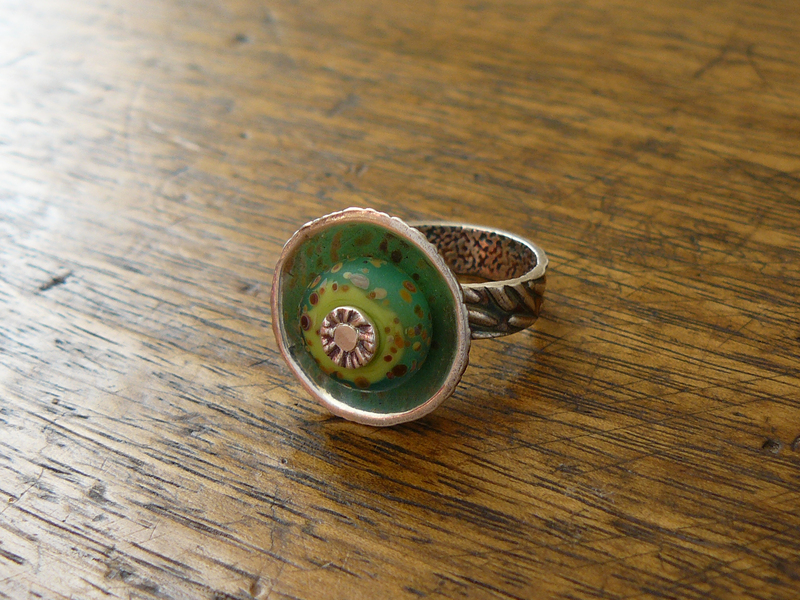 It has been creatively invigorating to make rings in a way I never expected. There are so many possibilities for movement and so many tiny considerations that make a ring interesting. The kinds of questions that I ask when I sit down to start a new ring are: what shape should the shank be, how wide, should it have texture, should both sides of the shank have texture, should they be the same or not, should they match the top element. 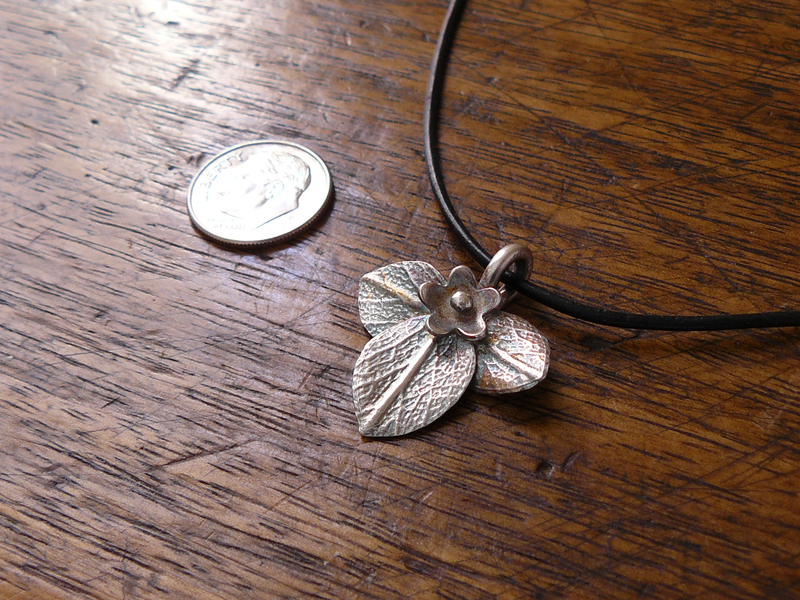 Of course I also have a theme in mind for the project like a leaf or a flower or a bowl shape. The idea can evoke a mood or a feeling. For the ring above I wanted something green, something that felt like walking in the forest. The idea I wanted to bring to the fore was about calmness and peace. I have been doing some copper etching recently. A few of my results are shown in this photo. I used nail polish as a resist and scratched it off where I wanted etching using a scribe. This method is giving me nice crisp edges to the etched areas. I am able to etch as deeply as I like because the nail polish is not beginning to loosen anywhere during the process like the paint pens and other ink resists I had tried before. Mistakes are easy to repair before etching as well. I love how easy it is to remove the nail polish afterwards too. 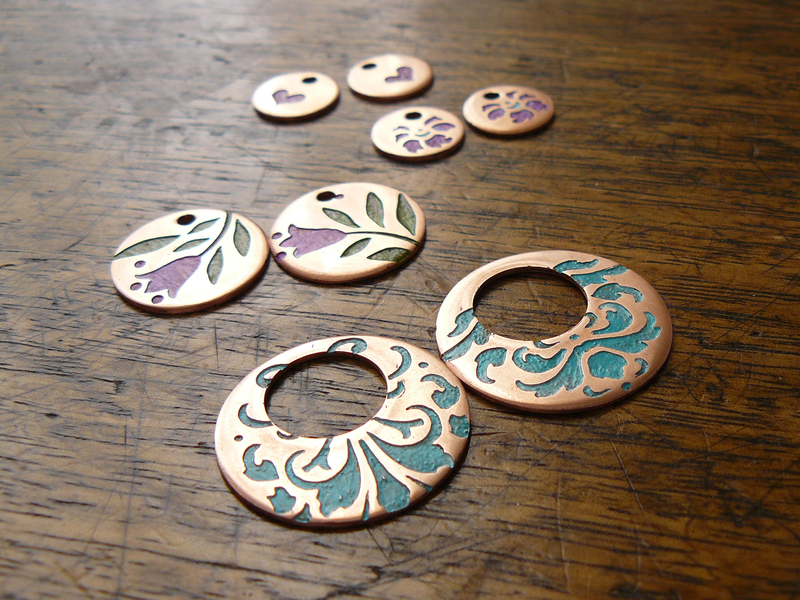 The etching bath I used for these is peroxide/muriatic acid. I love how fast it works. 25 artist’s booths will be in the new pavilion and the festival will be held rain or shine. Local car clubs have been invited to display their vehicles. Wine tasting will be available all day. Ropp Cheese will be serving samples and selling. Greg Williams will be performing throughout the day. There will be the sidewalk chalk drawing area for kids and free face painting too. I have a couple of truly unbelievable items in my kiln right now and since it is hard to photograph things that are glowing hot I thought I would show you these earrings inspired by ocean waves lapping the beach. 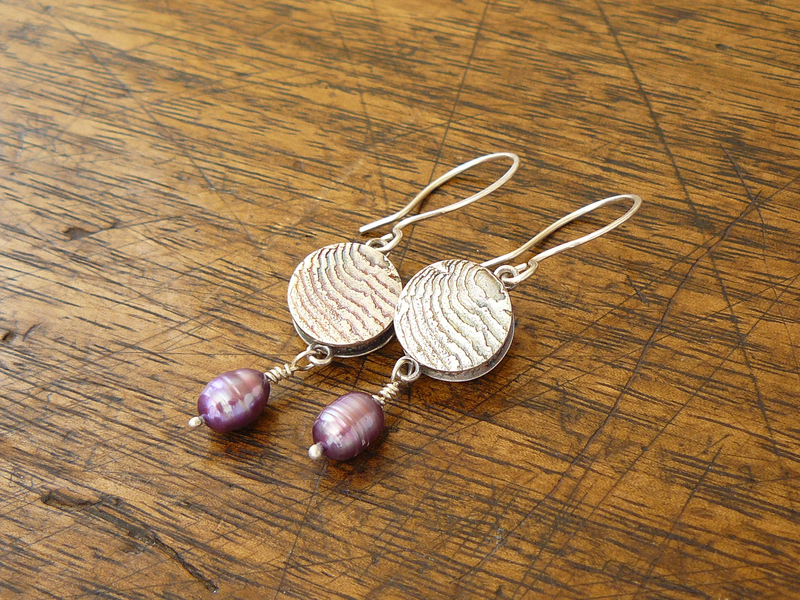 They are fine silver box earrings with argentium sterling silver wires and cultured pearls. You can see them in person at the Art on the Promenade this weekend in East Peoria. The fair is a new one and is being held from 10 to 5 both days at the new Target complex. I believe there will be about 40 artists there and I feel honored to be among such fantastic company so come check the fair out and see all of the new stuff going on in that part of East Peoria. The new clock tower building looks almost finished. Saturday the 8th (that is today) I will be at 1700 Moss Avenue for the Moss Avenue Sale. Come by and check it out. I am quite near one of the stages with live music. This seems to be near the opposite end of the sale that I was set up at for last year’s event. I have lots of new goodies. These lovelies are so new I have not gotten to photograph them yet. Please stop by! This weekend is Mother’s Day weekend. As usual, the Peoria Heights Art Fair is on Saturday along with Race for the Cure. I hope to see all of you local folks there! I have some lovely goodies I am in the process of photographing so check back over the next couple of days for that also! Ear in the Envelope This Friday! I will be displaying my work at Ear in the Envelope Friday May 3rd from 6pm to 9pm. Ear in the Envelope is located at 820 SW Adams St, Peoria 61602, Enter through the Alley from Adams to Oak St to May St. Liz Barnes, owner of Ear in the Envelope, has invited a number of jewelry artists for this First Friday event. There will be nibblies and live music as well. Come join us for a lovely evening! I have quite a number of new items to show you when you stop by!